It’s been raining & cold for days on end and I’ve spent lots of time in the kitchen making RancherMan’s favorite – bread. 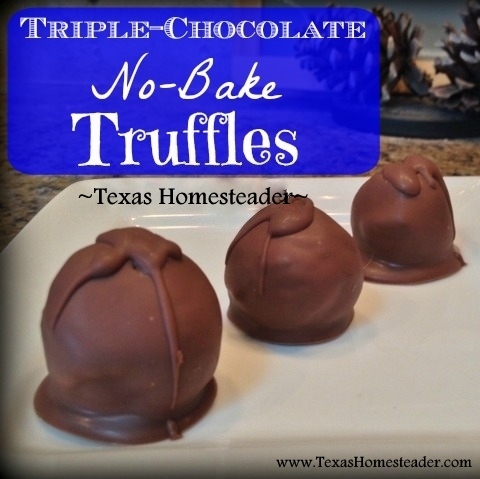 But RancherMan’s been in the kitchen too, making MY favorite – no-bake truffles. For Valentine’s day a couple of years ago he made me Mint/Chocolate Truffles but today he’s making Triple-Chocolate Truffles using double-fudge-stuffed chocolate cookies because, well you know, a girl can NEVER have enough chocolate! 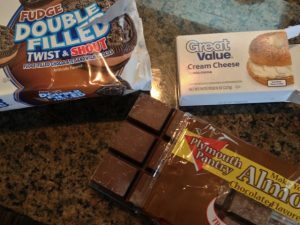 So into the kitchen he went, armed with the few very basic ingredients needed to make my favorite special treat: A 15.25-oz package of double-filled fudge cookies, an 8-oz block of cream cheese and a few squares of chocolate almond bark. No really, that’s all it takes. #canyoubelieveit?? He started by placing the cream cheese in the KitchenAid mixer bowl to cream it thoroughly & smoothly. Then he used our Ninja blender to completely pulverize the entire package of cookies. Now he simply dropped the pulverized cookies into the bowl with the cream cheese and mixed them together until it was all smooth. When the cookies & the cream cheese were thoroughly blended he set the KitchenAid bowl in the fridge for about 30 minutes to harden the mixture somewhat. This made the mixture a little easier to dip. He then used a cookie scoop to measure out approximately one tablespoon of mixture for each truffle. Then he placed the shaped truffles in the freezer for about thirty minutes, which firmed up the truffles quite nicely. While the truffles were in the freezer he melted 5 squares of almond bark in the microwave, then stirred in about 2 tablespoons of butter-flavored shortening to smooth the chocolate beautifully. After the stint in the freezer he used a toothpick to dip each truffle into the melted chocolate to fully coat it. The dipped truffle was placed on waxed paper, then placed back in the fridge for about 15 minutes to harden the chocolate. This recipe made 2 dozen chocolate-dipped truffles and they were absolutely DELICIOUS! The truffles he made last year were mint-chocolate because I’m nutty about the combination of mint/chocolate. But I’m guessing you can change up the flavor of your truffles simply by choosing whatever flavor cream-filled sandwich cookies you like. In the past we reserved some crushed cookie crumbs to sprinkle on top of the finished truffles and although the presentation was beautiful, I think by not including those reserved cookies in the truffle mixture it made the truffles themselves a little too soft. This time we used the entire package of cookies to form the truffles and I like the texture better this way. Soften cream cheese & blend until smooth. Crush entire package of sandwich cookies and add to the cream cheese in the mixer bowl and blend until thoroughly combined, scraping sides of the bowl often. Cover the bowl & place in the fridge for 30 minutes, or until firm enough to handle easily. After bringing the truffle mixture out of the fridge, use a cookie scoop to form truffles into approximately 1-Tablespoon balls. 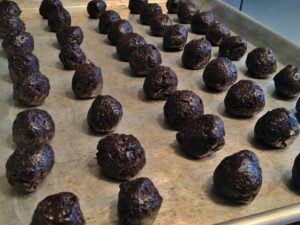 Place shaped truffles in the freezer for about 30-minutes to firm them up. In the meantime melt 5 squares of chocolate almond bark and stir in 2 Tablespoons of butter-flavored shortening. Using a toothpick dip each chilled truffle into the melted chocolate & allow to drain slightly before placing chocolate-covered truffle on wax paper. Place back in refrigerator for about 15 minutes to harden the chocolate coating. Store finished truffles in the refrigerator. Can be brought to room temperature prior to consumption or enjoy them chilled. 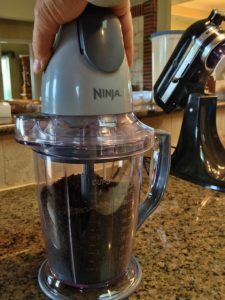 This entry was posted in Blog Posts and tagged Cooking, Frugality, Make-It-Yourself, Recipes on March 15, 2015 by Texas Homesteader. I remember these and still make them every-once-in-awhile. Not often or I’d never fit through the doorway. :} Seems like everything that passes my lips; widens my hips. Have a great day and an enjoyable weekend. I love my ninja, too. I’ll have to try it with this recipe. I love truffles. These sound really yummy too. Yum! This looks so good! I love chocolate. Thanks for sharing the recipe with us at the Merry Monday link party. I hope you’ll join us again next week. Sharing your post on Twitter! I have had some of these… they were absolutely amazing… and so was the fact that I found out the dad of the family and his 2 little boys had made them. 🙂 I need to make these sometime. You had me at triple chocolate. Oh my goodness, these look delicious! I am pinning these for sure! I love the chocolate! Yum!! Thanks for linking up on My 2 Favorite Things on Thursday!! Hope you come back this Thursday and share some more!! I love having you! Pinned! I love truffles. Sometimes I’ll splurge and get them at the pretty store downtown but your recipe looks so easy. Pinned! I’m over from darling downs diaries. I love candy – and this looks so easy and yummy. I will give this a try. I also like to have some simple delicious recipes on hand to give as gifts and this would made a wonderful gift. Thanks so much for sharing !!!! You had me at no bake and then chocolate, lol! Thanks for sharing at Thursday Favorite Things! Yummy! Those look so good. Thank you for linking up with Idea Box! Please join us again next week! These look lethal. I could probably down a dozen at a certain time of the month with a glass of cold, raw milk 🙂 I am also nutty for the mint and chocolate combination! Thank you for sharing this week at the Art of Home-Making Mondays! These love fabulous. Can not wait to make them. I think these would be great to have around Easter weekend when the kids are here. Thank you for sharing and Have a Fabulous Day!! Happy St. Patrick’s Day I absolutely love Truffles of all kind and so very lucky of you to have a wonderful man to make them for you. My hubby needs a recipe on how to boil water. :} He’s totally clueless when it comes to making something in the kitchen. I didn’t make me no truffles yesterday but I did make some green Mint Chip Cookies. Enjoy your day. Was so nice yesterday that I went out in the afternoon and mowed part of our yard. Perfect weather for working outside. Oh my gosh, YUM!! Yes please! Be still my heart! What a wonderful gift these would make and the mint ones would be just what St Patrick’s day calls for! Have a wonderful week.